Some viewers may think "this road is four lanes wide in every direction, and the pavement is perfectly wide enough to have a good, segregated bike lane". Those people are missing the point. The four-lane-wide road provides enough space for an HGV to do a U-turn. So letting it get up and park on the pavement in the direction it's going. You couldn't do that if there was a cycle path here. The sheer provision of a vast off-road "pavement" here is a fantastic facility for motorists. It's wide enough that street furniture can be kept far enough back to make parking along here easy -regardless of the length of your vehicle. Bristol just lacks the imagination. Even that "let them park on the pavements" mayoral candidate explicitly mentioned Gloucester road as an example place where paveparking shouldn't be permitted. Yet Gloucester Road is a shopping street -like this one in London- the provisioning of more pavement parking area is what is critical to keep it alive. Look at the one here -even with all this excellent paveparking it's barely surviving. by doing this on a "shopping street", Brent makes sure that nobody who actually -insanely tries to walk to the shops will feel as unwelcome as they should be. All it takes is a continual line of traffic, pig-pen barriers to make you feel unsafe, and no attempt to provide anything other than a dropped kerb. The best bit? That wide pavement provides extra parking opportunities. Being a rich and successful driver presents many opportunities for you to present your achievments to the lesser mortals. You have the car and the personalised plates and this gets the admiring looks, well for a while at least. But then what? How do you tell the world that you have really made it? Anyone can get a flash motor and personalised plates hide the age. 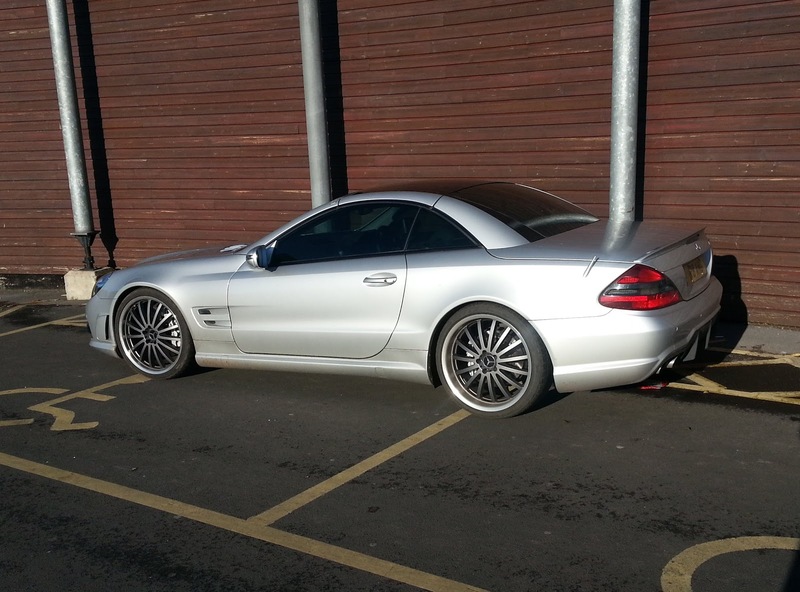 Well, nothing says that you can afford not to give a damn like illegal and downright inconsiderate parking. This car park had plenty of available spaces and at £1 an hour, surely it is within the means of anyone. 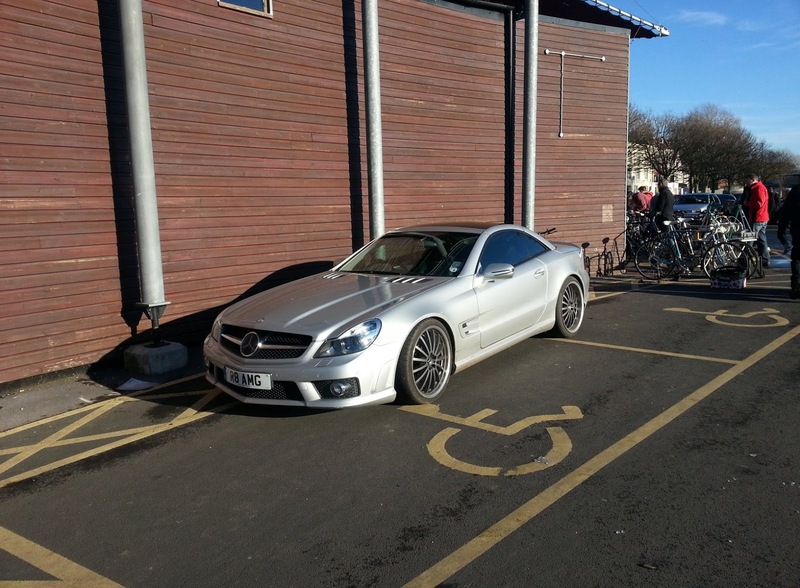 But no, far better to take not one but TWO disabled parking bays to show you can afford not to care about tickets. No blue badge here nor even a pay and display ticket. That's for the little people. R8 AMG does this with such finess that they even manage to do this next to a bicycle jumble sale! Let's show the poor people who can't even afford a new bicycle, let alone a car, what real achievement can bring! Don't condemn this driver. They are giving us something to aim for. Should we fear the new mayor of City Hall? I know you may have concerns that our new mayor doesn't have the need of the city's important car drivers close to his heart. 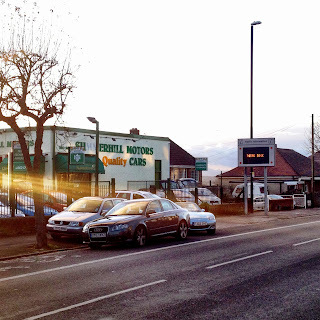 Hopefully this picture of him parking his car on double yellow lines in a bus stop will put your mind at ease. I'd feel more comfortable if he was driving a 4x4 or transit van rather than an electric Smart car, but you can't have everything. Looks good to us: he's already got a bicycle and a pedestrian in front of the car, ready to run them over. As everyone knows -tax dodging cyclists love to cycle the wrong way up one way streets -streets put in by an anti-motorist council to make cycling more "convenient" than driving. Once these tax-dodgers get used to contraflowing, they end up using those routes even when they drive a car -or in this case, a coach -as seen here in Fishponds. Before anyone says "how do we know this coach driver is a cyclist?" -the answer is obvious. Only cyclists go the wrong way down one-way streets, so this driver is a cyclist. Something is not right. 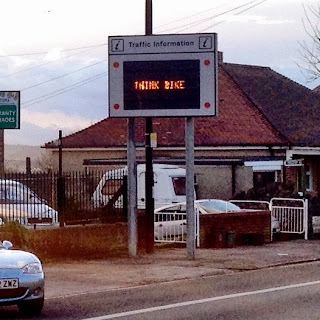 The council are trying to brainwash our faithful Bristol driving masses. "THINK BIKE" messages on electronic boards on our commuter route from our country residences to our city waged jobs. Not local neighbourhoods that we are passing through. This is definitely first and foremost our commuter route. 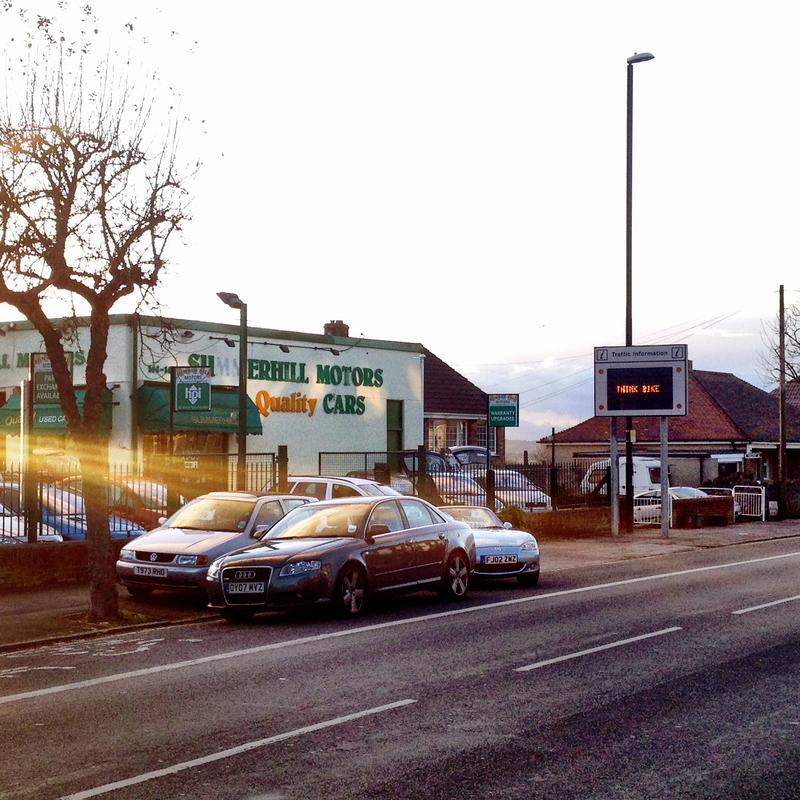 So it's good to see Summerhill Motors sticking up for us, the intrepid commuters, and fighting the walking and cycling message that the City Council are trying so hard to push on us. They've gone to the trouble to park not one, but two cars, successfully totally blocking the pavement and another third car in the bus / cycle lane. A double score! Giving a strong message to not only pedestrians that walking is just not acceptable, but also to those trying to use public transport or cycle too that their behaviour will not be tolerated. To make it even better this is on the "Wesley Way" route that the council have created to encourage people by telling them that this is a safe walking and cycling route! It is also close to a local school, hopefully showing those that choose to walk or cycle to that school that such behaviour is just not right. They should be driving the school run, preferably in a car bought from Summerhill Motors. It's good to see the local businesses sticking up for us, the not local people and helping us to remember to "Think Bike" but then to "Do Car".